Check your facebook for the event invite and RESPOND! If you're not on facebook or didn't get the event invite for some reason...just come!!!! ***Special thank ya to tim who put this show together and included me and gave me a lovely wall to show on and wonderful ideas for presenting my new addition...RINGS! (That's right...I've made rings out of my photography...maybe magnets soon too. I'll post pics soon.) 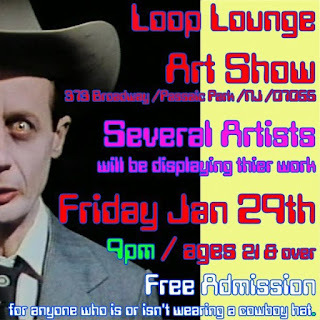 Check Tim out on facebook at LOOP LOUNGE ART SHOW. Friend him and you'll hear about all the shows he puts together at the loop in the future! Hope to see you all there this Friday. people have been asking a lot of questions about my process. i am guessing that the art doesn't exactly translate perfectly on the computer. "are those real nails or pictures of nails?" so...here's a quick little explanation. the pieces that i previously posted are my photos, adhered to 4 or 5 pieces of wood. the wood is nailed together and burned. some of the photos are burned and some of the photos treated with chemicals to create a texture on the actual photo. I have shown some of my work to "ladies". ****LADIES=WOMEN WHO LOVE THE PHOTOGRAPHY BUT WOULD NOT HANG THE "ARTWORK" IN THEIR HOMES. so...they have inspired me to just frame some of the photographs solo. be sure to check that option out at my next show. the pieces i am putting up today are not on wood...they are on record albums. there are 2 or 3 albums put together using fasteners. again, burning and treating going on as well. again, click on the photo to see the larger size. looking at it that way, you can see the textures of the burning and treatments/crackling of the photographs. you will notice the one photo of the gas sign is shot using the "through the viewfinder" technique. if you dig it...i'll be putting up more of these types of photos soon and explaining that process as well. pretty cool shooting through the lense of an old camera, using your digital. :) hope you enjoy these pieces as well and again...i love feedback so feel free to comment or email! just getting this site up and running and quite excited about it. i started taking photographs a few years ago and decided a few months ago that i would like to do something with them. i knew that i definitely wanted to do something with textures as that seems to be what draws me in to art in the first place. i found that playing with wood, nails, epoxy, fire and ink, i could create something that screams erica. and i believe i have done just that. if you click the pics to ENLARGE them, many of the photos in the pieces themselves have a texture to them, an almost crackling, smearing that i have done, besides the obvious textures of the wood, nails and burning. most of these first pieces i have posted are about 1 inch thick and range from 5" x 5" to 5" x 7" to 7" x 9" in size. i participated in my first art show in december, and it was awesome to just get my stuff out there and have it be seen by others. Post show...i now have pieces hanging in three different homes. not a bad start. so...check out some of my pieces. bookmark my website and keep checking back for new blog postings and pictures. feel free to leave comments...i love to hear feedback. i have two possible shows in the works and of course i will keep you up to date on any art shows i will be involved in. thanks for checking me out on www.ericaresnick.com and stop by often!